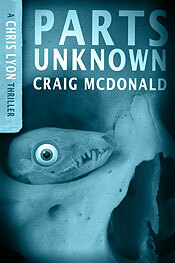 PARTS UNKNOWN is based on the notorious Cleveland "Mad Butcher of Kingsbury Run" murders investigated by legendary "Untouchable" Eliot Ness. The first in the Chris Lyon series also includes an exclusive interview with James Jessen Badal, author of the definitive study of the Cleveland Crimes, "In The Wake of the Butcher." 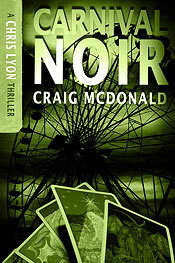 Also included is an exclusive preview of the Hector Lassiter novel, ROLL THE CREDITS. Sun Valley, Idaho. Former journalist Chris Lyon falls for Salome Arnaud, a dark-haired, dark-eyed stunner, seeking the whereabouts of her long lost father. Soon enough, Chris is not only trucking with seedy touring carnivals, but becomes an increasing object of obsession of Salome's stepfather and the fiend's equally off-putting twin brother, a televangelist of dark reputation. As Salome's secret history is revealed, Chris realizes their fates are tangled in a sinister conspiracy stretching far back in time—a dark design fashioned by an ancient cabal of killers and Satanists who have Chris and Salome squarely in their sights. 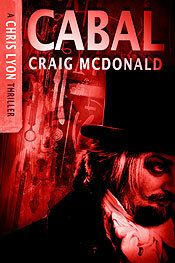 CABAL pulls back the curtain on the conspiracy threatening to destroy Chris Lyon and his family—a twisted plot driven by a mysterious murder cult stretching far back into history. 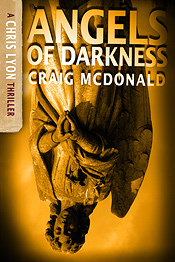 The third Chris Lyon thriller sets the table for #4, ANGELS OF DARKNESS, coming April 2013 and featuring an appearance by Hector Lassiter. The worlds of Chris Lyon and Hector Lassiter collide: For centuries, a secret cult has satisfied its blood lust while quietly prodding history down the darkest of alleys. For nearly as long, an ancient order of Celtic knights has fought back. Stretching from the Scottish Highlands to snow-swept Chicago, ANGELS OF DARKNESS is the final novel in the "Dark Cabal Quartet," and a reach back to TOROS & TORSOS and ONE TRUE SENTENCE. It is the capstone of an unprecedented saga of serial murder and secret history; a wildly original thriller about the efforts of two long-persecuted men of letters caught in the crossfire not just to survive, but to turn the tables on both factions to devastating effect.